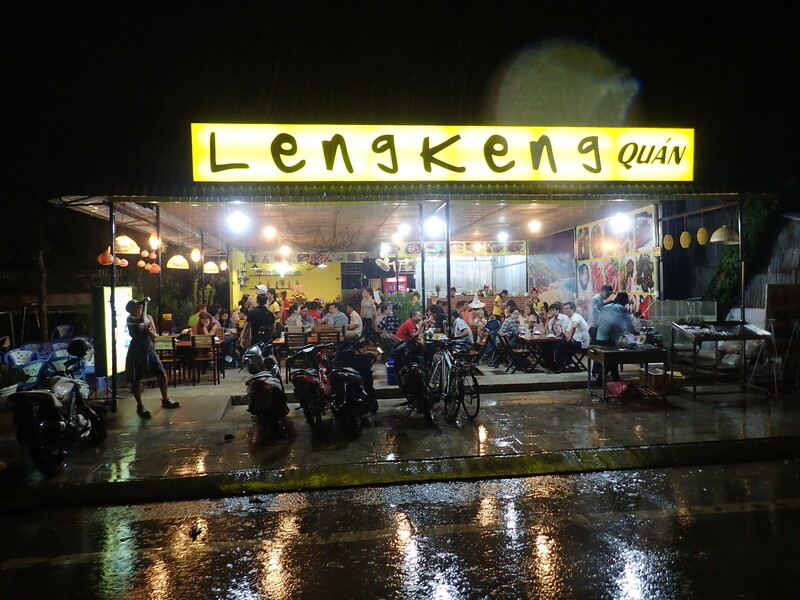 Compared to the grueling 27 hour door-to-door travel experience of a few days prior, our 35 minute flight from Saigon to Phu Quoc Island via Vietnam Airlines was like falling off a log. Shuttle buses offered to carry travelers into town on the western shore, about 6 miles from the airport, for $2.25 but taxis at the curb charged $4.50 for the two of us so it was a no-brainer. Arriving at the Canary Hostel, set across the road from the beach, we are immediately impressed by its immaculate condition and warm greeting. Red tile floor, small swimming pool, food and drink service, dorm and private rooms are all well kept and constantly being mopped and wiped clean. We’re in the six bed mixed dorm with 3 bunks sporting one of the most comfortable mattresses I’ve slept on. WiFi and air conditioning work flawlessly. Prices for food and drink are considerably higher compared to Saigon but considering we’re on an island, it’s expected. And while higher, the prices are still cheap. 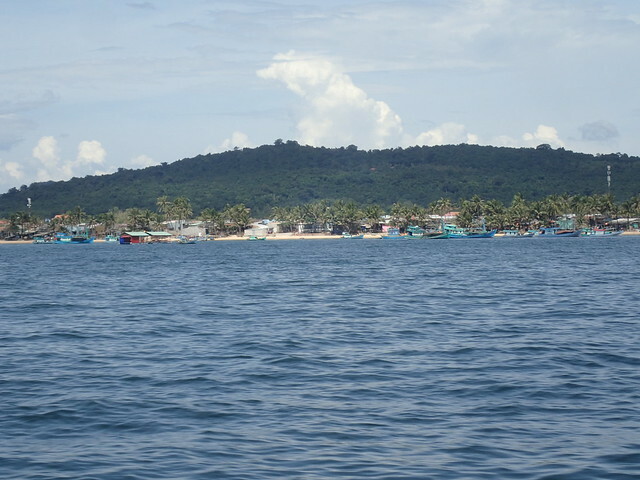 Phu Quoc is the largest island in Vietnam. Glancing at a map it’s a wonder it isn’t held by Cambodia. Tropical and relatively undiscovered, most land area is untamed National Park with thick forest, streams and waterfalls while the shoreline boasts some of the finest beaches in all Indochina. 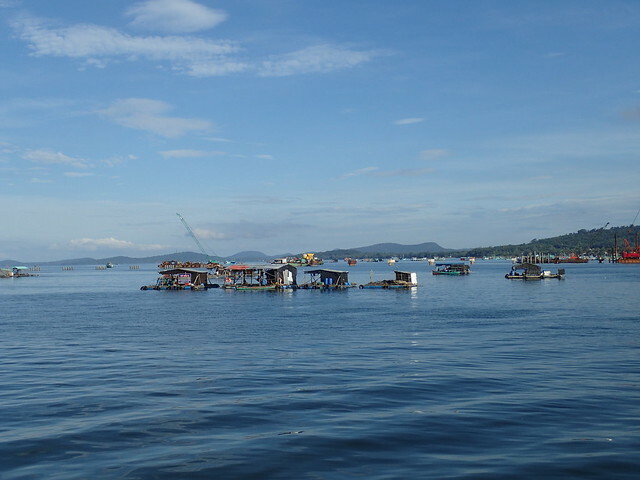 The island is best known for fish sauce factories and black pepper farms though swelling tourist numbers has introduced the production of cultivated pearls, the flawless white orbs proudly and prominently displayed in blazingly bright shops. But tourists and their open wallets bring demands for luxuries beyond pearls. 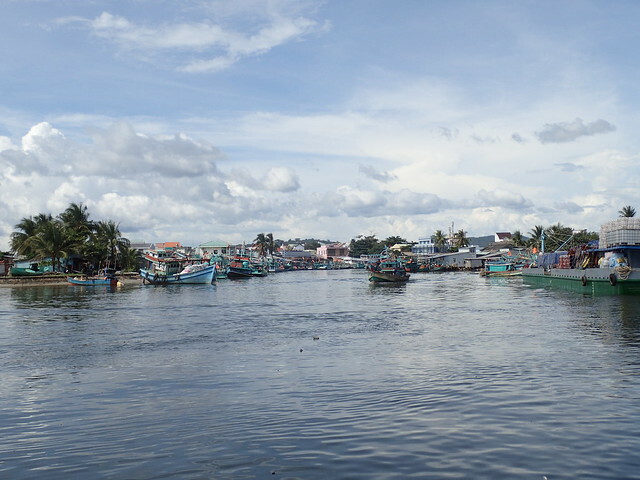 Historically, residents have made their living from the sea and Phu Quoc is ill equipped to feed or house new arrivals to expected standards. Restaurants are mostly mediocre and one must be on their guard to avoid the all too common “tourist tax” so prevalent in 3rd world countries. Attempting to morph from isolated Vietnamese tropical paradise to competitive tourist draw, Phu Quoc is, for the most part, more miss than hit. Many resort and condominium developments have either stalled or failed. 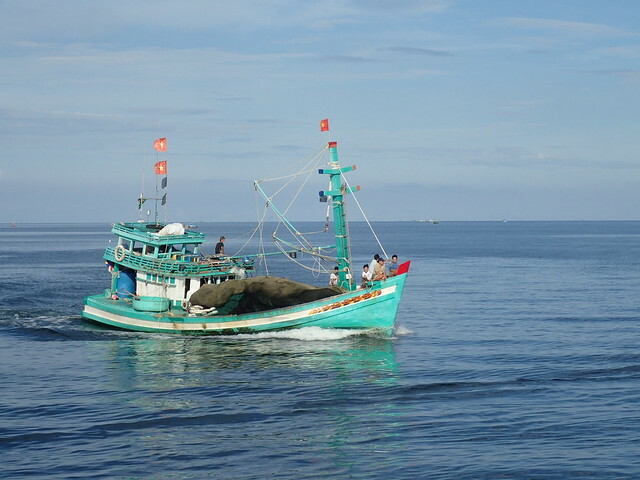 But time is on their side and as the rich surrounding waters become fished out, greater urgency will be made to convert farming and fishing to tourism. Let’s hope they don’t destroy one paradise while building another. Canary Hostel is situated about 1 mile south of the only town of any size, Duong Dong, so it’s a fairly easy walk to restaurants and services. Setting off for food mid-afternoon is disappointing. After a prolonged search, a small road side food stand offering bird daisies and pig guts caught my eye. Not keen for guts, I was intrigued by the bird daisies. A ten inch horizontal steel ring suspended about a dozen petite whole birds from their necks, grilled and brushed with a sticky sauce. Served with a plate of dry white rice, the flavor and texture is like chicken though the fowl is so small there’s practically no meat. Makes you wonder why anyone would bother. 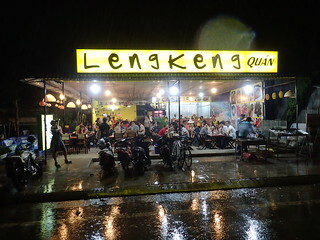 Once done with dinner, like clockwork, a steady rain falls. Monday morning, a van from Rainbow Divers arrives to carry us north to harbor docks where we board a boat to take us on a two tank scuba dive around a diminutive boulder, Turtle Island. 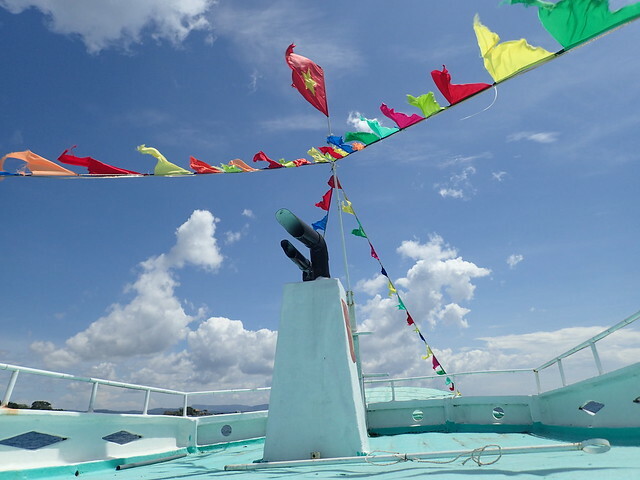 The boat is chartered by the dive shop and it looks like it netted fish in a previous life. Entering the first days of “dry season” we have a forecast of sunshine all day, our first. All previous days have had a steady rain from 1 to 2 in the afternoon and then again in the early evening. Being the beginning of the dry season implies it’s also the start of the tourist season though it was not yet in full swing. We’re the only divers on the boat today. The ship’s captain, first mate, and two dive masters, Maia and Harrison, gave us a crew of four. 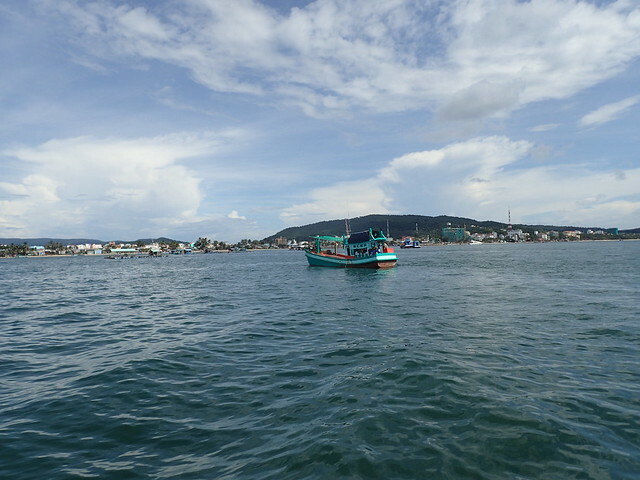 Shoving off under growing puffy white clouds, a big lumbering diesel engine had us blasting north across the Gulf of Thailand at the breakneck pace of about 10 knots. Divers have two options when choosing dive sites here: north or south. 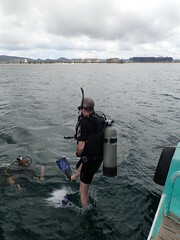 North is shallow with a maximum depth of about 7 meters. This worked out well as I hadn’t dove in 5 years and it’s been 8 for Saffron. After 45 minutes we arrive at our site and the engine drops to idle and the anchor is tossed overboard. After a briefing on equipment, safety procedures and hand signals, we don our gear and take a giant stride off the stern. Saffron opted for a quick refresher before the actual dive and descended the mooring rope with Harry for a ten minute recap while I lazily circled their position like a lingering shark. We then set off for a 50 minute dive where large, numerous black spiny urchins slowly crawl the sea floor. Coral is plentiful but the abundance and size of fish is lacking. 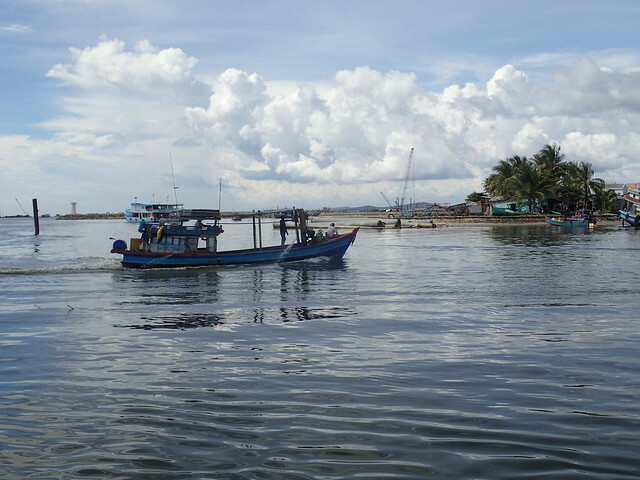 Earlier, as we motored to our dive site, numerous fishing boats were seen trying their luck to fill holds. This area is clearly over fished. 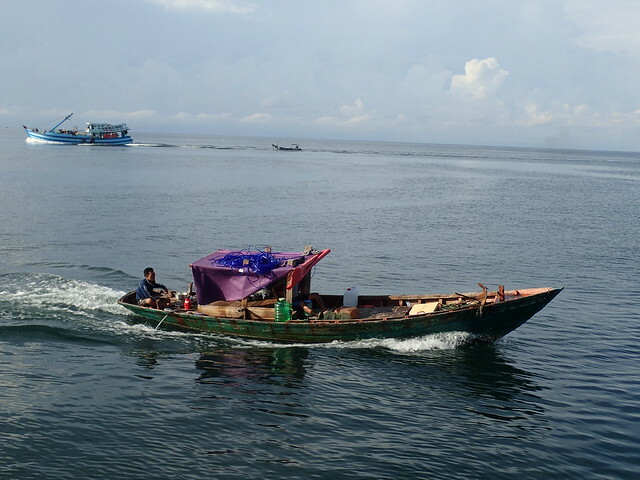 Previous days rains have washed sediment into the waters reducing visibility to 6 or 8 meters. But welcome sunshine pierces the depths to cast radiant colors our way. Once back aboard, a quick snack was had before another 50 minute dive. Being this shallow we surfaced with 1300 psi each time. 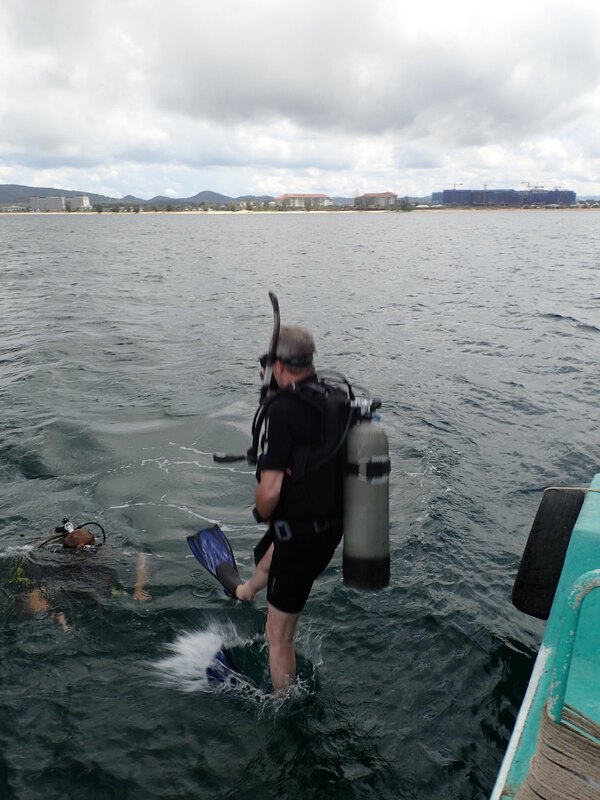 Rainbow Divers is a professional outfit staffed with proficient dive masters. 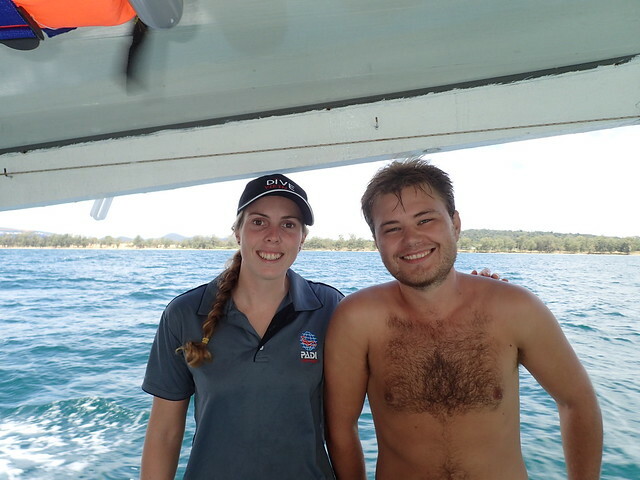 Punctual and polite, Maia and Harrison did a great job watching over a couple of rusty divers. A good time was had by all. Share the post "Dive! Dive! Dive!"